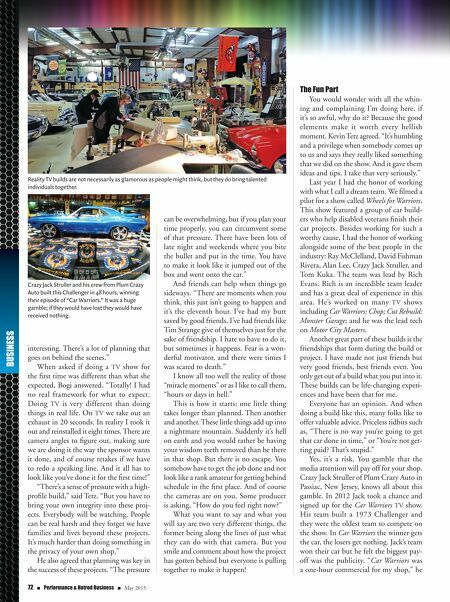 May 2015 n Performance & Hotrod Business n 73 says. "Plus, being on Car Warriors led to other opportunities." His team leader on the show was Ray McClelland. Through Ray, Jack went on to work on Motor City Masters and then on Wheels for Warriors. Through these shows Jack has expanded his network of contacts and friends in the custom auto industry. Yes, you gamble that the media attention will pay off for your shop. And doing charity projects gives it two ways: helping a good cause and hope- fully bringing some media attention for the shop. The Valkyrie Project So why are over 20 women coming from all over the Northern Hemisphere to work on a 1969 AMX? The purpose of the project is to showcase the wide range of talented women in our industry, and to inspire women to explore their interests in the automotive and motorsports fields. The National Institute for Automotive Service Excellence reports the number of certified female technicians has more than tripled in the last 10 years, yet women still represent less than 1 percent of the total ASE-certified technicians. The numbers are even lower for collision techs. We will have two months to get the AMX ready to drive on the Hot Rod Power Tour. The biggest advantage I have is that this is not the first, second or even third time I have done this. As I am enough of a masochist, having signed on for a num- ber of these, I have a good idea of what to expect. The first reality? Things will go wrong. Weird stuff, things that seldom happen. The Twilight Zone will settle over the area and paint and body filler will not dry. Or it will rain for two weeks straight. We will go home at the end of the day, happy in the knowledge that we got the body of the car looking nice and straight. Then overnight, the bodywork gremlins will come in and get it all wavy again. And there are always the black holes that one or two very essen- tial, impossible to replace items will fall into. These things will happen on Friday afternoon, usually at 5:01 pm. So in addi- tion to ordering parts, organizing my team, I'm preparing for a variety of disasters. Note the plural. There will be more than one. And when the nightmare happens, I will remain calm with the knowledge that I have been through worse and survived. In one week I will be on the road to Tampa. And a number of women will be traveling across the country to work with me. Most of them don't know each other. How many will show up? Will we pull it off? What unexpected disasters will pop The Today Show Chopper 2007. One of my first high-profile charity paint jobs and an example of using the best product for the project, even if you have to pay for it. I had planned on having four weeks for the paint work. I ended up having nine days to sandblast the parts, molding and bodywork, paint, artwork and clearcoat. I had to use products I had experience with, that I knew would get the job done in time. At the time, I really didn't how to approach companies for sponsorships and the time factor didn't allow for it. Five years later I began to have a relationship with PPG, the company whose paint I used. On "Wheels for Warriors," working with Rich Evans taught me a good deal about leading a team. Rich keeps a cool head when things go wrong and calmly works through the problem. He also listens to us and makes each member of the team feel valued. No one team member is more important than another. up during the build and how far will they set us back? What absolutely indispensable tool or piece of equipment did I leave 600 miles away in my shop and where can I find one at 2 a.m.? How many times will I stand back, shake my head and wish I were having dental surgery? And the biggest mystery, just what is lurking below the surface of the existing paint on the car? Tune in next time to meet the ladies of Project Valkyrie and see if we pull it off! JoAnn Bortles is an award winning custom painter, air- brush artist, welder/fabricator, tech writer, and photojournalist with over 30 years of experience in the automotive industry. She is the author of seven books on automotive, motorcycle, and custom painting. Her work has been featured in numerous automotive and motorcycle publica- tions, NBC News, The Today Show, MuscleCar TV and Motor City Masters. She also serves on SEMA's SBN Select Committee. 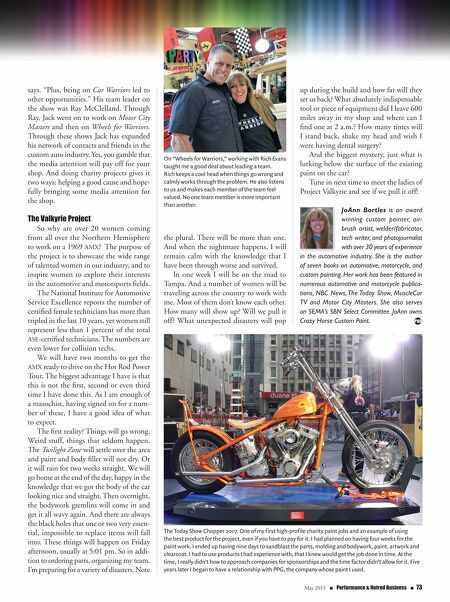 JoAnn owns Crazy Horse Custom Paint.